FAB make, LOVING your palm tree image, shame you can't recall the make. Guess the S was meant to be here... 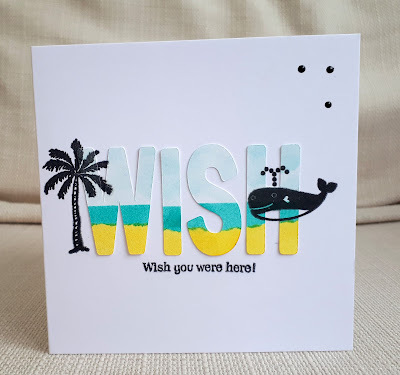 Fantastic card and I love the stamping over the letters! What a fantastic idea here with the bold letters and beach scene throughout. Glad you found the 'S' and it certainly makes for a fun and eye-catching CAS card. Thanks so much for joining us at Less is More this week. Super card! Love how you colored the letters. A fabulous card Marina, such a fabulous design - I love your colourful sentiment, I'm so glad you found the 'S'. Your card is fantastic, i love the CAS design. Thank you for joining us at the Stempelgarten Challenge. Hi Marina, what a cool CAS card. Love the little scene you created by colouring the letters and adding few stamps. Great! Yay!!! You found it! Love this scene depicted within your bold letters, such a fabulous effect. Such a fun card, Marina. I love the colorful letters combined with your black stamping and the old stamps look great, I'm glad they got to be inked again! Thanks for joining us at Less Is More! love how you coloured the word, what a fun idea. Great card and design! I like the clean style! Thanks for sharing your piece of art at Challenge up your life!